Joseph Henry Sharp was sixteen years old when General George Armstrong Custer, accompanied by the Seventh United States Cavalry, rode confidently into the valley of the Little Big Horn River. Like the rest of the nation, Sharp was shocked when he read the horrifying accounts of the Custer “massacre.” Though Henry Sharp could not know it at the time, this event was to have a profound effect on his life. 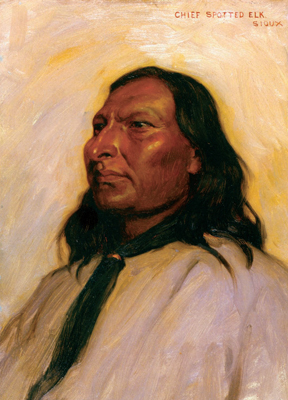 Almost a quarter of a century later he would befriend and paint portraits of many of the Indians who fought against Custer that day, and these very portraits would be largely responsible for his fame as one of America’s most important artists. subjects. Indeed, Sharp was unrivaled in his effort to document the proud heritage and civilization of the people whose culture he knew was destined ultimately to vanish in the face of the overwhelming western movement of the white man and his machines. The third son of William Henry Sharp, Joseph was born just across the river from Wheeling, Virginia (later, West Virginia), in the raw little farming community of Bridgeport, Ohio. Raised on sights and sounds not unlike those of a Mark Twain novel, Henry was an enthusiastic and adventuresome lad, although thin and somewhat frail. Holding his father’s hand he would cross the “beautiful” (the translation of the Iroquois word “Ohio”) river and walk along the cobblestone streets of Wheeling, delighting in the lively street scenes and activities of the bustling port. Back home across the river, Henry and the other boys fashioned crude rafts that Henry’s imagination transformed into great ships capable of navigating wild and dangerous waters. They explored caves that seemed endless, each one filled with Indian ghosts performing mysterious and frightening rituals. And sometimes Henry climbed to the uppermost branches of the giant oak trees and gazed dreamily westward, imagining adventures in which he and his friends explored the vast Western frontier and parleyed with the great Indian warriors of legend. In later years, Sharp recalled two childhood experiences which had a lasting impression upon him. 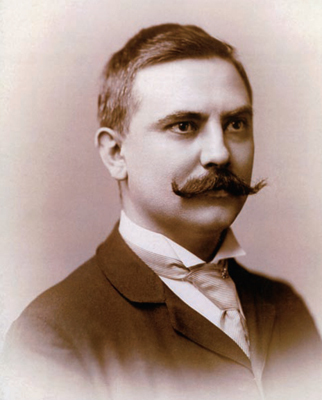 Encouraged by (his mother) Elizabeth, he read The Leatherstocking Tales by James Fenimore Cooper. These highly romanticized novels kindled his imagination, as he learned about the strange and exotic culture of Cooper’s “noble red man.”. 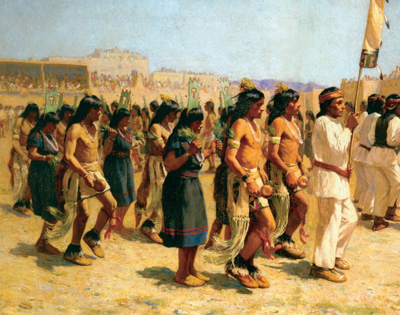 The second experience, which burned an image in his mind forever, was his first encounter with real Indians. by these strange, forceful figures, Henry stood there speechless, holding fast to his father’s hand and absorbing every detail of the scene. The memory of that day stayed with him for the rest of his life. Then tragically one summer day when Henry was about twelve, he had an accident which left him with a permanent loss, a handicap which indirectly accelerated the development of his artistic talents. While “skinning the cat” on an iron bar under a high bridge spanning a river, Henry lost his grip and fell into the fast-moving current. A man working near the bridge saw the accident and ran quickly to the boy’s rescue, but by the time Henry was pulled from the water, he was close to death. At home, Elizabeth frantically rolled him back and forth over a barrel to force water from his lungs and allow air to enter, the only known treatment at that time for such an emergency. Her action saved her son’s life, but his ears became infected, and within a short time his hearing was gone forever. From then on he lived and worked in a soundless world of solitude to which he would adpat and which would provide a degree of tranquility. Yet Henry would also hear this monstrous disruption of his youth in dark, unspoken turmoil. 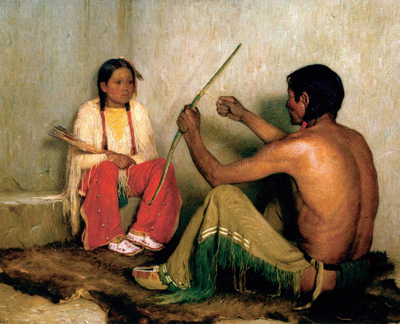 Henry’s fascination with Indians became a preoccupation, and in school he doodled incessantly on his slate and books. 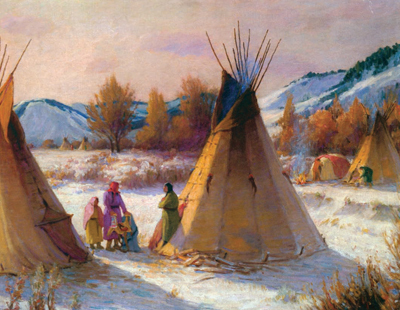 Teepees and fearsome Indian chiefs in feathered bonnets marched along the margins, revealing his already impressive sketching ability. One afternoon in 1876, Sharp read the screaming headlines: CUSTER’S SEVENTH CAVALRY MASSACRED BY SAVAGES. The lurid prose of the article that followed described how Custer, a flamboyant Union officer during the Civil War who afterwards had gone west to fight the Indians, had led his column of 212 cavalrymen into battle against overwhelmingly superior Indian forces led by the great chiefs: Crazy Horse, Gall, and Two Moons. The battle had taken place on June 25 among the rolling hills of Montana near the confluence of the Big Horn and Little Big Horn Rivers. According to the newspapers, Custer and his men had fought off a charge after charge by the “savages,” but had finally perished to the last man. Custer, for the moment, was a hero to most. Later, controversy, criticism, investigation, and congressional hearings would raise questions about the judgment and conduct of Custer and his fellow officers. For Sharp, the incident was a source of personal conflict because the Ohio-born general had been one of his childhood heroes. 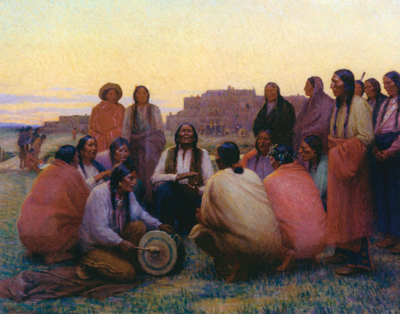 He believed that Custer and his men had behaved gallantly; however, his long fascination for Indians made him sympathetic to their cause, and he could not help but admire their stalwart defense of their lands. The year 1876 was important to Sharp for other reasons. After three years of study, he now had a solid grip on the fundamentals of drawing, and the models he sketched became increasingly lifelike on his pad. Though still a neophyte, he had become very much a part of the Cincinnati art community and was at last beginning to gain some local recognition. Most importantly, his portraits and sketches were beginning to sell, enabling him to continue his studies. During the next three years, Sharp’s work continued to improve, and in 1897 his painting, An Artist’s Attic, was selected for exhibition in the annual Cincinnati Industrial Exposition. Listed as number 254 in the catalogue, it commanded a price of $150, quite an achievement for a relatively uneducated deaf boy, only recently up from the raw Ohio frontier. Because of this success and because of other accomplishments, Sharp began to think seriously about the future. His first priority was to continue his education. Because instruction in American art schools was limited, study in Europe was essential for artists who wanted to refine their styles, learn the latest techniques, and be taken seriously by the public. And so, encouraged by friends and possessing more dreams than money, Henry Sharp sailed for Europe in the fall of 1881.